McLuhan states that "We have had to shift our stress of attention from action to reaction. We must now know in advance the consequences of any policy or action, since the results are experienced without delay. Because of electric speed, we can no longer wait and see" (63). I feel as though many games today follow this same pattern he is noticing. There are many games that choose to base the game play on your choices. What you do effects the ending. Sometimes, people don't like that at all and they will search out guides that will tell you how your choices will affect the outcome. Andrew Hardin states that "different people become immersed in games in different ways. Several people I work with find games unexciting no matter what kind of game, or how good. They will probably play few games in their life, and wouldn't even if they died and went to gaming heaven. Many people don't want to play anything besides a party game, and some will play just about anything. It's not a question of theme, it's a question of how that theme immerses you in the game. It's not a question of mechanism, it's how that mechanism immerses you in the game." I feel as though the appeal to games that give you different outcomes based on your choices rely mostly on mechanics. I have play a variety of these types of games and they might have some similarities in theme, but the mechanics in the game is what makes these games interesting. In order to get the player immersed in the game, these game designers are choosing to make the player choose their game. Some really good examples of this type of game play are Mass Effect, Telltale's The Walking Dead, and the Stanley Parable. 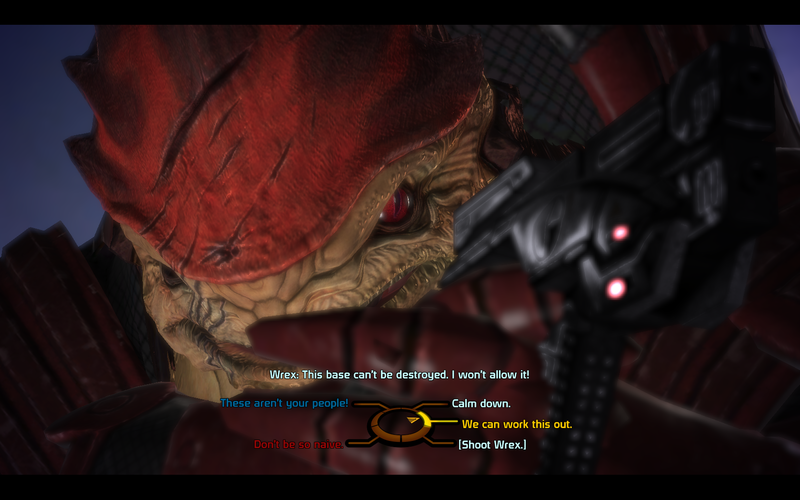 In Mass Effect with each conversation you are given choices to respond with. Some are actions, but most are dialogue options. The more you talk with people, the more they trust you as a commander, if people don't trust you, you might not be able to save them. The right choices will save certain characters. There are various endings to the game and even more ways to get there. Your choices carry on from game to game so a choice in the first game, might create certain characters to not appear in later games. In the Walking Dead game, you have similar dialogue and action choices. However, in this game, you have a time limit. If you don't say anything, then that character will remember it. There are also quick time events that require your action as well. Telltale even tracked player's choices to help write further installments of the game. In the Stanley Parable, your choices are a little more subtle. You have a dialogue wheel to help see what all the choices are. If you stand around deciding, the narrator will notice and say something about it. Simply going through the right door instead of the left will give you a different ending. This game has about 20 different endings. In all these games, choices matter. Our actions cause reactions that we can see almost immediately. These games all have different themes to them like saving the galaxy, surviving the zombie apocalypse, and figuring out what's going on in your office. However, they all have the game game mechanic of choosing your story. The game becomes yours. Each play through could be totally different than the last. Players become so immersed in the game. Some players will actually seek out guides to know what their choices will decide so they can get the play through they want. Going back to McLuhan, he says that these types of games have become popular because of the aspect of choosing. I know from experience, I wanted to know what I needed to say in order to keep characters alive in Mass Effect. I wanted to say all the right things to get the ending I wanted. I didn't look for guides and I wound up getting the perfect ending (in my opinion). I did keep multiple save games in case something went wrong. I believe that McLuhan is absolutely right when it comes to video games since more and more of these types of games are coming out. I completely agree with how games have become more reaction to an action. I've played some of Mass Effect and The Walking Dead and I really enjoyed being more engaging with the character because it felt like I was immersed in the gameplay and it wasn't just a pre-set path where these events WILL happen, happen. It becomes more dynamic and involved as a player. Even the small things such as the characters actually speaking and talking to one another vs. a dialogue box appearing and having to read it becomes more engaging because the player gets a sense of emotion behind the dialogue. Quick Time events have been around for awhile, not too long, but a good number of years and most of the time if you fail a quick time event, you can re-trigger the event to do it again, but this time better and actually executing it properly. On the other hand, quick time events in the Walking Dead become permanent and the game forces you to choose one life or another's without much time to think. My sister has never liked games. Videogames, (Not sure about party games), but even board games because her attention is elsewhere and there is no way that the game mechanics or theme will ever entice her long enough to play a complete game without being somewhat disinterested. Quick time events are really interesting, but can also be really challenging. In games like the newer Resident Evil games, those quick time event are so quick and if you press the wrong button or don't press anything bam, you're dead, start over and watch that whole cut scene again. It's very demanding and I wasn't very good at pressing these buttons so quick. However in games like Mass Effect I really enjoyed quick time events. I agree with your connection to the reading and how video games are being more and more based on choices. Your example of Mass Effect is a good one, but I think it connects to the reading even more than your analysis. For example, Mass Effect gives you (the player) Paragon and Renegade options, but in most of the in-game dialogue, you can take as much time as you need to think about what to do. Compare that to Paragon and Renegade actions in the cutscenes, where you have only a few seconds to react to a specific action, similar to how McLuhan says that "we can no longer wait and see". The quick time events is definitely something I should have brought up. There are many quick time events in Mass Effect and The Walking Dead. Another game that would have been really good to bring up is the game Heavy Rain. I started playing it over Christmas break but lost my save data and I just recently started playing it again. In that game, I feel like you control everything. You hear what the player is thinking, you choose dialogue, you control actions in both quick time events and regular events. The game is really interesting and maybe I'll be able to talk about it in a future blog post.